Like many decision makers, you may be more than ready to improve the effectiveness of your company’s LMS training program. However, before moving forward with such a venture, it’s important that corporate leaders determine if they feel confident in their LMS (Learning Management System) program-building skills. Talent development is increasingly becoming a top business priority for organizations, with 69% of learning and development professionals noting it as their number one priority in the future (1). Finding the right LMS is only half the training battle. The other hurdle is getting students and employees to actually use the eLearning platform. This may seem like a tough feat, but an effective corporate training program streamlines the process. And, believe it or not, designing this type of program isn’t all that hard to do. Most employees want to do their job faster and more efficiently. 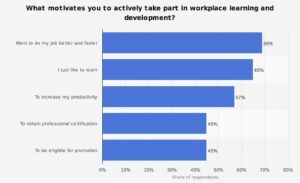 69% of respondents from a recent poll noted that this is what motivates them to actively participate in workplace learning and development (2; Chart). Furthermore, designing the right types of these LMS training programs is imperative for organizations. Before you start creating a training program, you must identify the need for training within your organization by asking what skills your employees need most. In How to Design Training, Blink staff encouraged content creators to “talk with the learner or with the learner's manager or supervisor to assess the learner's skills, knowledge, and experience.”(3) It’s imperative for management to assess employees’ goals for training and determine if there is an educational gap between what the student needs to be doing and what he or she is actually doing. Individual companies have different objectives for training. Most organizational leaders first and foremost want their employees to gain and maintain the skills needed for job competency. Another good potential goal for a training program is to increase employee satisfaction and decrease turnover. Simply providing collaborative training that gives employees opportunities for peer-to-peer connection can go a long way in accomplishing this. In addition to maximizing employee skill sets and increasing worker satisfaction, a well-designed LMS-based training program can significantly lower a business’s bottom line. If “reduce costs” isn’t on your list of objectives for training, maybe it should be. In fact, you might find that totally phasing out live, instructor-led training is the right move for your company. 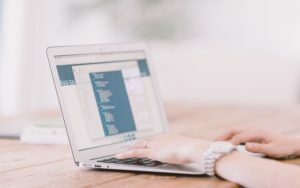 Related Reading: In our blog article 5 Reasons Why Online Learning is Valuable, we explain exactly how eLearning is more cost-effective than other types of training. Creating eLearning content might appear intimidating to the untrained, but it shouldn’t. Try your hand at crafting online learning content with eLearning authoring tools suggested by expert Christopher Pappas (4). If this idea doesn’t appeal to you, then “shop” for eLearning content. Some LMS providers offer an eLearning content library free of charge to their customers. After browsing, administrators can pull content relevant to their company training objectives and employee needs. Alternatively, company leaders can opt to hire an instructional designer to create eLearning training content. Once your team has a new, improved training program up and running, administrators should conduct polls and surveys to assess its effectiveness. The best way to ensure a corporate training program remains highly effective is to continuously ask for employee feedback and apply it. Read more about why we love social learning, and you should too! Is employee engagement with your company’s LMS low? Are your employees’ skill sets lacking? If so, consider giving your LMS corporate training program a makeover. It’s possible to see an increase in employee happiness, retention, and overall productivity result from taking this action. Thomson, Lindsay, and Deanna Pate. “2017 Workplace Learning Report: How Modern L&D Pros Are Tackling Top Challenges.” In Learning with Lynda.com Content. “What Motivates You to Actively Take Part in Workplace Learning and Development?” Statista, Towards Maturity, Oct. 2016, www.statista.com/statistics/671794/factors-which-motivate-employees-to-actively-learn-online/. Blink. How to Design Training. https://blink.ucsd.edu/HR/training/instructor/tools/training.html#3.-Define-training-objectives. March 28, 2017. Pappas, Christopher. Free Authoring Tools for eLearning. https://elearningindustry.com/free-authoring-tools-for-elearning. July 22, 2012.